At Indulgence, you’d feel as though you’re being transported to another dimension, away from the hustle and bustle of city life, albeit being smack in the heart of the city. Minutes turn to hours without you even realizing it. 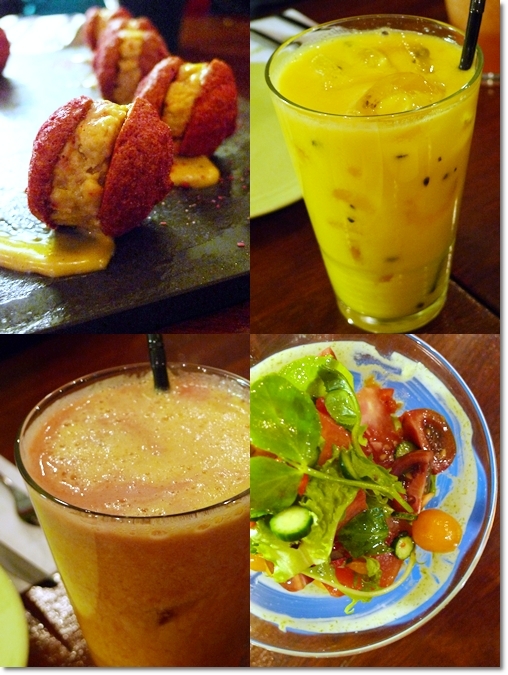 Just Good food, Good company, and a jolly Good time. Indulgence Restaurant is an award winning dining establishment, having won several Hospitality Asia Platinum Awards for Excellence. To imagine that this stellar restaurant’s roots stemmed from the charming, inconspicuous and quaint half-shoplot cafe in Canning Garden way back in 1996. Julie Song; the brains behind the concept, injects so much passion, energy and time into the setting up, running and maintenance of Indulgence. This is reflected by the sheer number of loyal customers (come on a weekend, and you’d better reserve your table!) perpetually on the lookout for her Specials written with chalk on the blackboards, and drooling over her dynamically-evolving menu. She assured me that nothing on the menu is permanent, and she changes the ingredients (mostly imported) from time to time based on the freshest produce of the season. 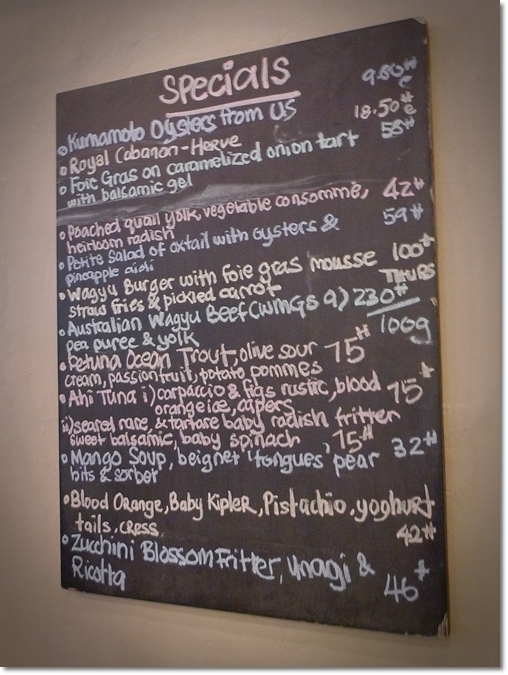 The Specials Menu with special creations written on the blackboard. You will see the waiting staff carrying the board to your table while taking your order, so you don’t have to squint at the board on the wall. Wanna know what we were served that evening? 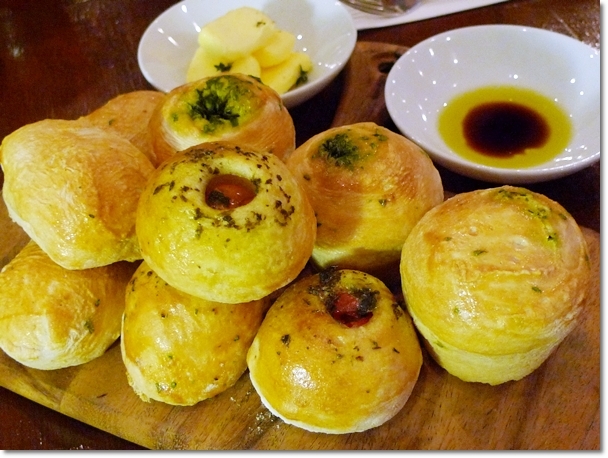 Keep reading for a gastronomic journey in a most Indulgent manner …..
Freshly baked breads served with blocks of herbed butter and olive oil/balsamic vinegar. The warm baby tomatoes bread was exceptionally fluffy and delicious. Just refrain from bingeing on these to save space for the entrees, mains and desserts. Julie strongly believes in the freshest of ingredients, most natural of flavours, textures and colours; hence everything’s prepared in a cohesively synchronized manner. Nothing that overwhelms the palate but you can still taste every single ingredient sans the excessive use of gravy or sauces. After all, quality meats, seafood and even vegetables need not to be doused in robust gravies. Instead, she concentrates on basic condiments and stock to bring out the flavours. Serving size may be on the smaller side, but this leaves the guest with the option to complete the meal with a starter, and capping off a splendid feast with a choice of desserts; hands down Julie’s forte. Started with some warm breads baked in-house, but we were given a ‘stern’ warning against devouring them all by Jessie, against temptations. Then the Amaretti; those purplish red confectioneries made their entrance at our table. A clash of the sweets (the pastry resembling a macaron) and the savouries (the rich and creamy foie gras mousse), you either love or hate this appetizer. 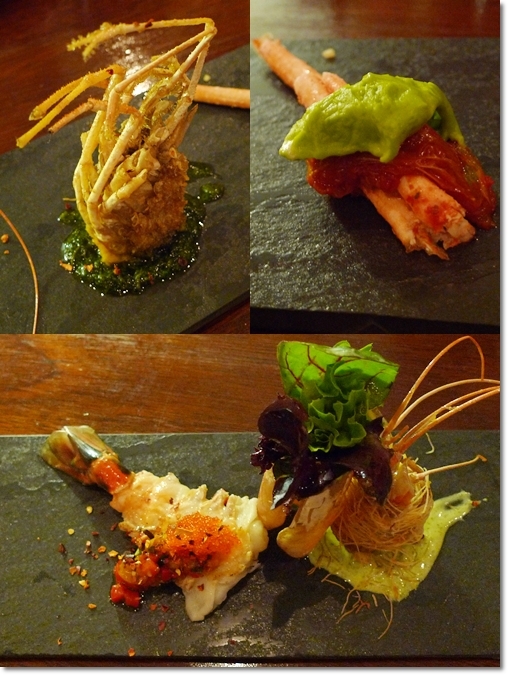 Not the most conventional of starters, yet I can see these dainty babies being on the Specials board for weeks to come. 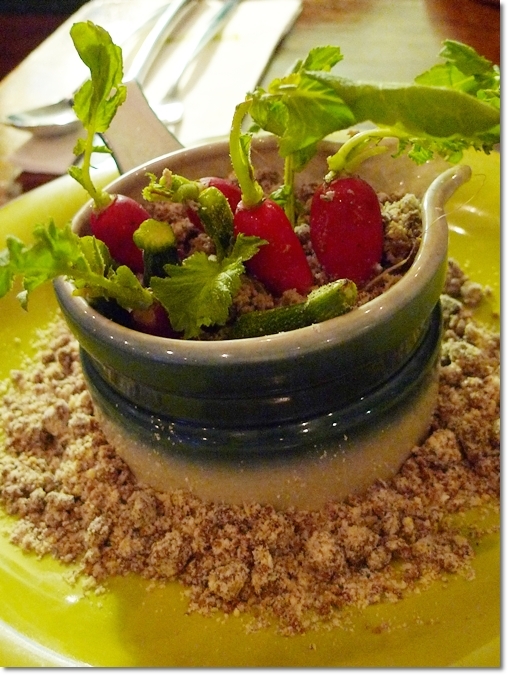 A Pot of Edible Vegetables and Soil – Not in the menu, nor even listed as one of the Specials. Maybe you can buy your way into Julie’s heart and get her to make something vaguely similar, but for the immense amount of work that went into this pot? I am counting my blessings. Now this pot of gold looks too good to be devoured. Imagine a vegetation of baby zucchinis and heirloom baby radishes buried in the ‘soils’ made from an interesting combination of sardine tapenade, hazelnut, sugar, flour and the slightest hint of chocolate. The ‘soils’ had this soft and chewy texture, but dig in deeper and you’ll be rewarded with a warm concoction of fennel puree; a cross between polenta and mashed potatoes. Oh, and of course, we DID use our hands to pluck the vegetables. The heirloom radishes tasted clean, crisp and fresh. 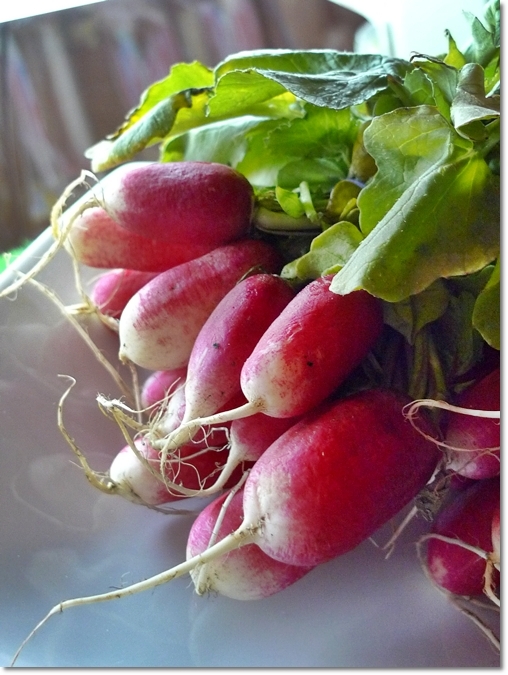 Though my brother was not fond of eating his radishes uncooked, and uprooted on the spot. 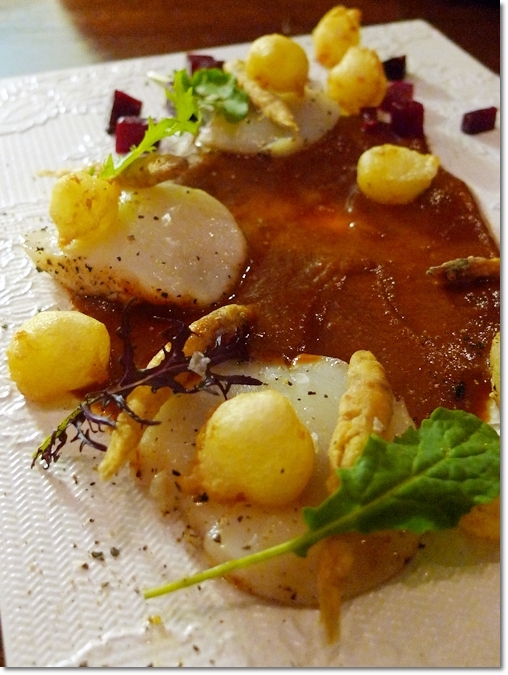 Hokkaido scallops with Australian crispy whitebait, a piquant lobster glaze and mozzarella balls. The scallops were slow-baked, retaining the juiciness encased in the plump exterior (Hokkaido sea scallops are generally larger), all the while managed to impress with its velvety texture; a cross between a scallop sashimi and a pan-seared one. The lobster glaze packed a slightly spicy, briny and robust punch, hence I do not advocate mopping up the sauce with the scallop. But if you have some leftover breads from earlier, you know what to do! On paper, this dish sounded funky. Okay, it was not even on any paper, menu or even on the board. 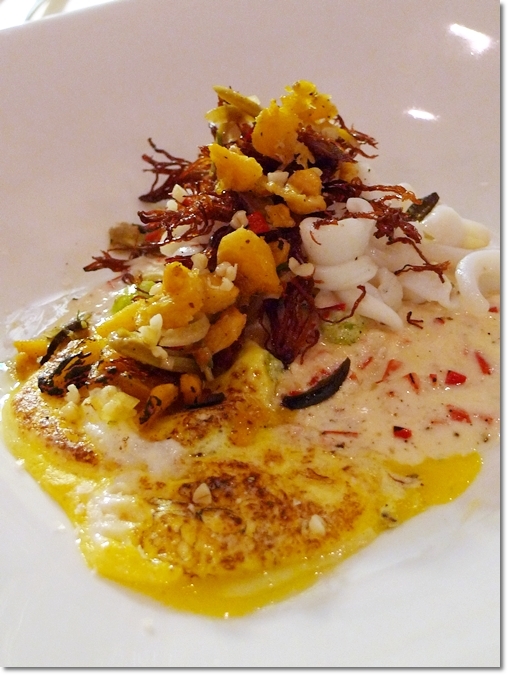 But was told by Jessie about this creation of burnt egg yolk; coupled with the sinfully decadent coconut cream. I was not able to identify the other ingredients, but boy oh boy …. did this dish screamed for attention. A charred aroma from the torched egg yolk, already laden with calories, then pushing the envelope with an equally rich coconut cream. The crispy duck confit, soft edamame beans and springy bits of calamari completed this ensemble, having us wondering which was the star of this dish anyway? A deconstructed Freshwater King Prawn – One large crustacean separated into four parts, and cooked in a quadruple of ways. I especially loved the head/carapace of the king prawn wrapped in kataifi, loaded with roes (intertwined with creamy mashed pumpkin, as I was told) and served atop a pleasantly tangy puree. The flesh from the claws was cleverly removed and served with a dollop of mashed pea puree, and oven-dried tomatoes. Most well-received dish of the evening? 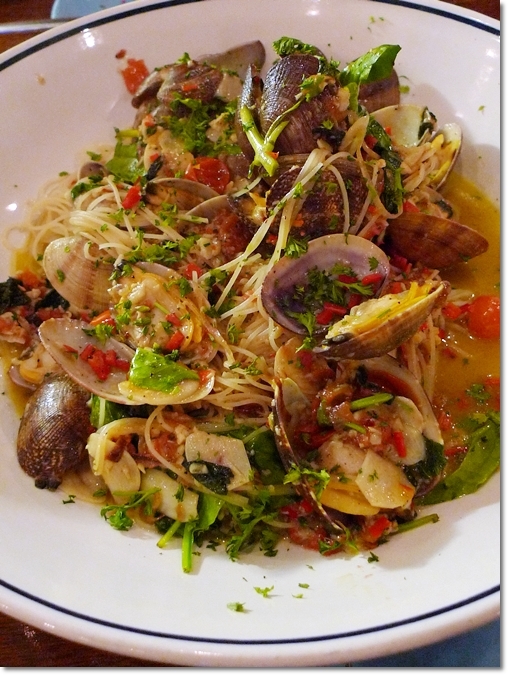 The Capellini Pasta with Littleneck Clams in a white wine-based sauce of course! The portion was HUGE, but we managed to slurp up the noodles, clams and all with much gusto; leaving a trail of destruction behind …. the emptied shells. And some leftover noodles. Burp. Imagine the sweetest, most succulent and plump pieces of sweet clam meat, coupled with the aromatic white wine broth (by request of course, as you can also have the pasta cooked in a non-alcoholic manner) infused with the tangy flavours of the tomatoes and herbs. 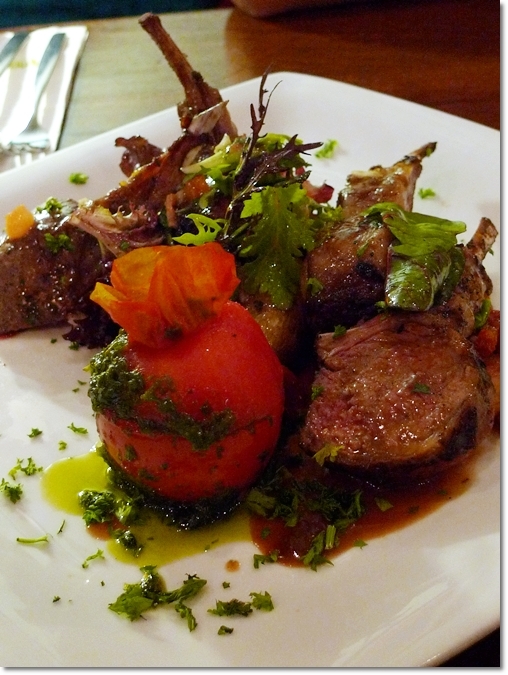 But if you are one who can’t live without your RED MEATS, then the Grainfed Cressy Farm Lamb Ribs from Australia (RM58/USD18.70) is a definite must-try. Cooked to a juicy Medium, the Aurora lamb ribs had none of those gamey taste, nor rubbery texture that needed much knife-work. How to fully enjoy the ribs? Use your hands, pick up the rib bone and indulge in your most carnivorous persona. Underneath the mass of meat you’ll find the highly sought-after Kipfler potatoes. They have this irregular shapes, and smaller than the usual Russet potatoes. Phew ….. think you have had enough? Heaving a sigh of relief? Wait. The BEST is YET to COME. that souffle looks darn good.. Yes, that crumbly creation had this very airy, whisked texture. Lovely stuff, with the zest from the imported cherries in season, and the refreshing redcurrant gelato. wow..on the house, lucky u.
went a few times right after it shifted to this new place. quality has deteriorated and i have never went back. ppl buy in to how the food was presented and with the bomb price, it must be good. Since it’s opened at 9am, does it serves breakfast? how’s the menu like? Yes, MM. I shall write about the breakfast at Indulgence in a future post. Too much to be included in the same post. Breakfast generally consists of your pick from their menu of roughly 10 items, with a coffee/tea or juice. Not cheap, about RM25-RM32 each set, but not your average bacon and eggs that’s for sure. The unbelievably fluffy ricotta pancake is to-die-for, really. You said it: At Indulgence, you should never ever skip the desserts. wanted to stay in this hotel but definitely out of budget… a bit overpriced IMHO! but then the food looks absolutely delicious.. I wonder if I have the time to come visit next month or not? 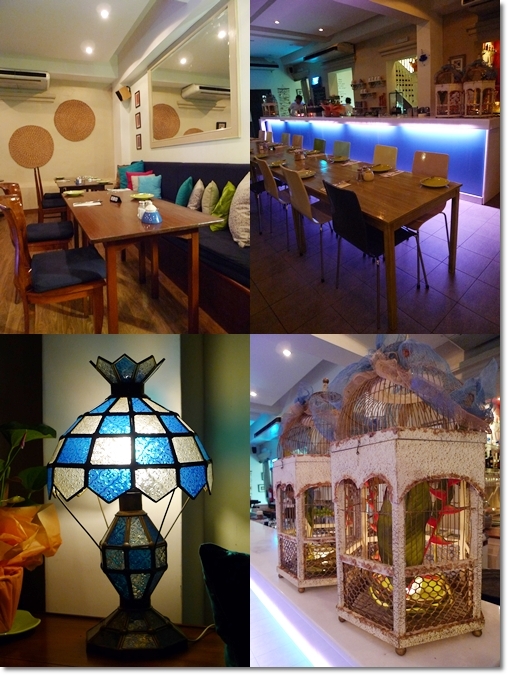 Hey.. wanna ask you.. New Oversea Restaurant.. is it near Tower Regency Hotel? If yes, how near? What about Tower Regency Hotel and Taman Boon Bak? Any idea? The OLD Oversea is very near to Tower Regency, about 5 minutes of walk away. But the NEW Oversea is definitely further. Maybe 10 minutes of drive, but definitely not walkable distance. Taman Boon Bak is in Pasir Puteh area, also rather far from Tower Regency. About 15-20 mins of drive if I’m not mistaken. Ahhh… U’re so lucky, J2Kfm 😀 I’m sure u must enjoyed urself well at there isn’t it? Oh boy… Just look at those meals u had there, you make me feel like going there too immediately.. haha.. I even clicked on your next page with desserts.. They are looking great! I’m sure Yv will gain few pounds if I bring her there xD Nice post there! Lol..
wow, this place is still going strong! I miss ipoh! YES! Soon, lingzie. As soon as I can set my head straight and do things a step at a time. Come Come! Let’s drag jason, wmw, or whomever else and have a feast there. I am sure Julie would be pleased. is it a halal restaurant??? ?